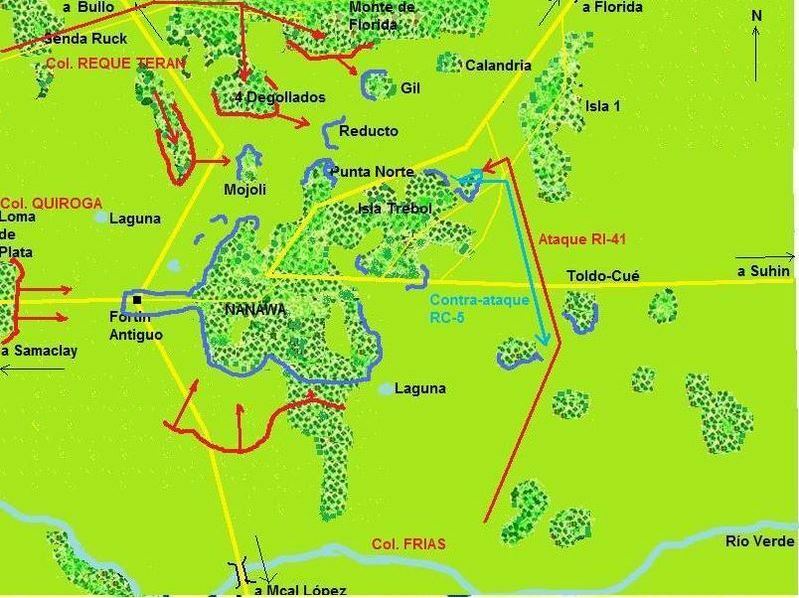 The First Battle of Nanawa was a battle fought from 20 to 26 January 1933 between the Bolivian and Paraguayan armies during the Chaco War. Paraguay in blue defending and Bolivia in red attacking. The Chaco War, fought between the South American states of Bolivia and Paraguay from 1932 to 1935, ranks behind the U. S. Civil War as the second-bloodiest war in the modern history of the Western Hemisphere. The Chaco War was fought for possession of the region known as the Gran Chaco, which covers about 100,000 square miles (260,000 square kilometers) and is a vast forested wasteland with little water and no re- sources that today comprises most of western Paraguay and part of eastern Bolivia. Although Paraguay ostensibly won the war, both states suffered heavy loss of life and were further impoverished as a result of the conflict. Paraguay’s population in the late 1920s has been estimated at approximately one million. A Spanish-speaking elite governed the country and ruled over an indigenous population of Guarani Indians. The economy of the country was based primarily on subsistence agriculture. In the War of the Triple Alliance (1865-1870) against Argentina, Brazil, and Uruguay, Paraguay lost huge swaths of territory and almost its entire male population. As a consequence, Paraguay became a country surrounded by hostile neighbors and constantly on the verge of extinction. Bolivia, on the other hand, had a much larger population of three million. The nation was also primarily indigenous peoples ruled by a Spanish- speaking elite. Subsistence agriculture predominated in the nation, although tin mining had proved an important source of revenue in the 1920s. The worldwide economic depression of the 1930s led to a fall in tin prices, and by 1932 Bolivia was deeply in debt and experiencing declining living standards. Prior to the Chaco War, Bolivia had lost territory through unsuccessful conflicts, suffering defeats by Chile in 1884 and Brazil in 1903. By 1932 the president of Bolivia, Daniel Salamanca, was determined to gain the Gran Chaco for Bolivia. The Gran Chaco region is best described as a forested wasteland that blends into desert on the western edge. The region had virtually nothing in terms of economic resources, and water was very scarce. During the course of the nineteenth and early twentieth centuries, the border be- tween Bolivia and Paraguay remained rather un- defined. The Paraguayans probably had the stronger claim to the region and had settled Canadian Mennonites in the Chaco in the 1920s to strengthen their claim. A theory widely circulated in the 1930s held that the war had been provoked by the American company Standard Oil, which had allegedly encouraged Bolivian aggression in the belief that vast oil reserves could be found in the Gran Chaco, but historians have since discredited that theory. Border clashes in the late 1920s and early 1930s culminated in full-scale combat on June 15, 1932, when the Bolivians launched an offensive. The war initially proved wildly popular in both countries, with vast crowds at train stations cheering troops departing for the front. Both governments undertook propaganda campaigns and public fund-raising drives. Bolivia’s Salamanca used the war as an opportunity to move against his political opponents by declaring a state of emergency and imprisoning many dissidents, especially members of left-wing groups and trade unions. The Bolivian offensive quickly stalled, and the Paraguayans moved over to the attack. The Paraguayans were led by General Jose Felix Estigarribia, a highly competent officer who under- stood the terrain of the Chaco. At the same time, the Bolivian Army was led by General Hans Kundt, an inept German émigré whose tactics consisted simply of hurling his troops frontally at prepared Paraguayan defensive positions. The Bolivians advanced in predictable patterns down roads that could be easily ambushed by the enemy. By contrast, Estigarribia stressed mobility with flanking and envelopment tactics and repeatedly surrounded the Bolivian units. He concentrated on capturing all the water sources in the Chaco, a strategy that inflicted much hard- ship on the Bolivians. The Bolivians troops, accustomed to higher altitudes, also had great difficulty acclimatizing to the low, swampy terrain of the Chaco. Many of the Bolivian soldiers could not understand why they were fighting for such a strange and worthless territory. Paraguayans, by contrast, saw the war as a struggle for national survival and had higher morale. How- ever, troops on both sides suffered from disease, starvation, and water shortages. 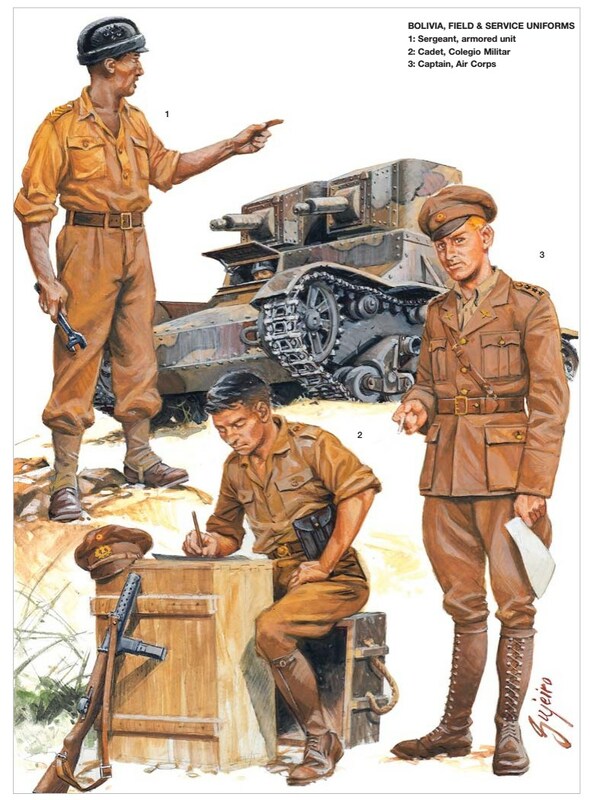 By late 1934 the Paraguayans controlled all the Chaco, and their armies were ready to advance into Bolivia itself. By this time, the Bolivians had begun to rally. General Kundt had been removed from command in December 1933, and President Salamanca was forced from office by the army in late November 1934. 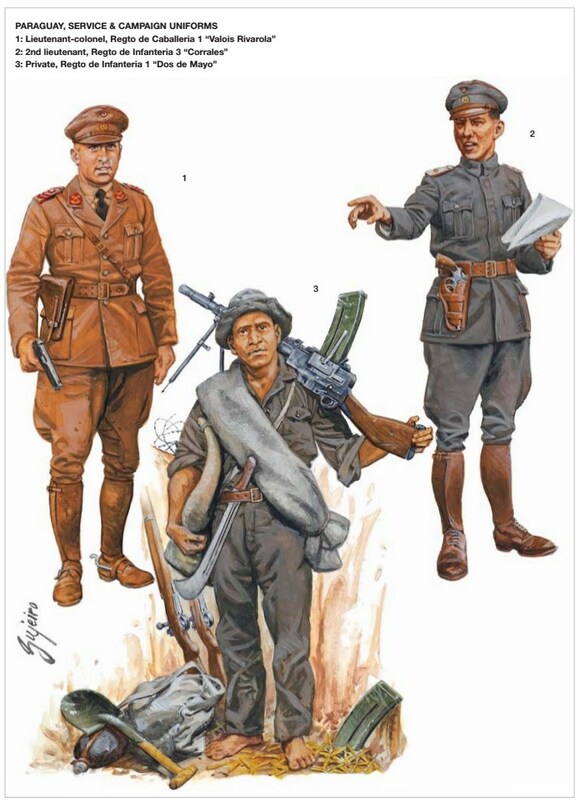 The Bolivians began to win some victories by April 1935, in part due to the fact that the Paraguayans were by this stage overextended and tired. However, the Bolivians realized that they were unlikely to re- gain the Chaco, either diplomatically or militarily. At the same time, Paraguay was running out of food, supplies, and ammunition and was on the verge on bankruptcy. As such, the two countries signed a cease-fire on June 12, 1935, with the war having lasted almost exactly three years. It took until July 21, 1938, to sign the final peace treaty, which left most of the Gran Chaco in Paraguayan territory. Although the League of Nations and neighboring states in South America had made diplomatic efforts to settle the war while it was in progress, neither side had a motive to end the war until mutual exhaustion set in. The Chaco War cost an estimated 100,000 lives, about 60 percent of them Bolivian. Bolivia had mobilized 250,000 troops during the war, while Paraguay had mobilized 140,000. Both states emerged from the war exhausted and debt ridden. Postwar recrimination in Bolivia led to much criticism of the governing elite, culminating in a revolution in 1952 that brought in modest democratic reforms. Bibliography Farcau, Bruce. The Chaco War: Bolivia and Paraguay, 1932-1935. Westport, CT: Praeger, 1996. Rout, Leslie. Politics of the Chaco Peace Conference, 1935-1939. Austin: University of Texas Press, 1970. Wood, Bruce. The United States and Latin American Wars. New York: Columbia University Press, 1966. Zook, David. The Conduct of the Chaco War. New York: Bookman, 1960.